Verdict: 4.5 / 5Gritty, beautiful, realistic and powerful, Mister Miracle is still garnering much-earned attention. Mister Miracle #8 continues to impress and stand alone amongst the already incredible competition. Whilst over books of its nature continue to tow the line between real life problems and out of this world comic book action and science fiction narratives, Mister Miracle still finds its strengths in its real-life grounding. 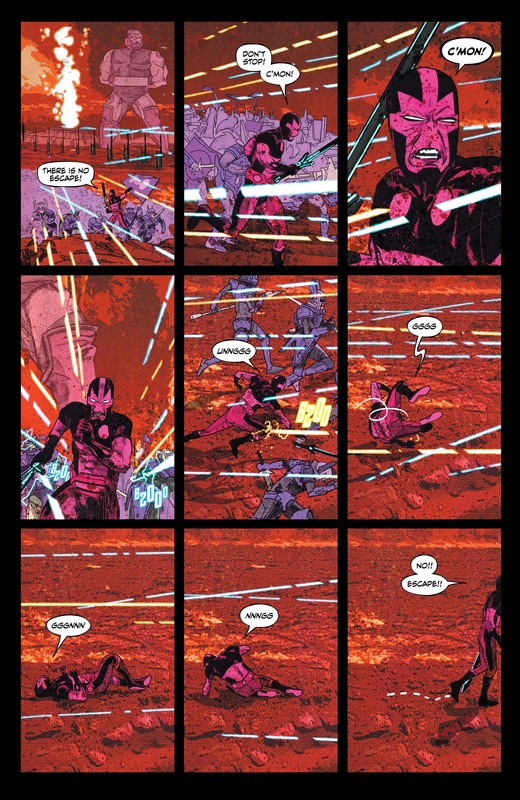 Focusing upon Scott’s relationship with his child and struggle to balance this life with his everlasting war with Darkseid, Tom King’s unique sense of humour, touching voice and penchant for impressive battle sequences continue to impress. Grounding this issue in something very relatable allows Mister Miracle to hold the heart of its other issues. Promising his child the world, through the continued motif of “Daddy’s going to buy you a diamond ring,” King explores the deep connection this new father has with his child as he struggles with the everyday challenges of parenting. Whilst his immortal battles go through all the hells of only a war can create, his life at home is in no way abnormal. The battlefield has become a place where Mister Miracle must negotiate peace with alien warriors, whilst also negotiating the doctor’s appointment for his infant. Whilst in other stories, a loss to a great warrior that could have ended the war, might seem like a heavy defeat and one that would shake our heroes, Scott takes it in his stride, recalculating for the future of the war. His primary focus appears to be raising his child. Perhaps there can be some peace found in the middle of war. An immortal man needs something to live for, that isn’t a never-ending contest of military tactical manoeuvres, but is instead something much more personal. His relationship with Barda isn’t explored anymore, her attention divided elsewhere at home. However, his friendship with Funky, as he adapts to the newfound situation of Scott’s parenthood, is explored further, allowing us a different look at his domestic life. Scott’s personal relationships are very much at the heart of this narrative. Whilst the switches to Apokolips are a welcome change of pace now and then, they never feel too detached from the larger story. This is a well-paced piece of storytelling that certainly deserves the accolades it will continue to acclaim. 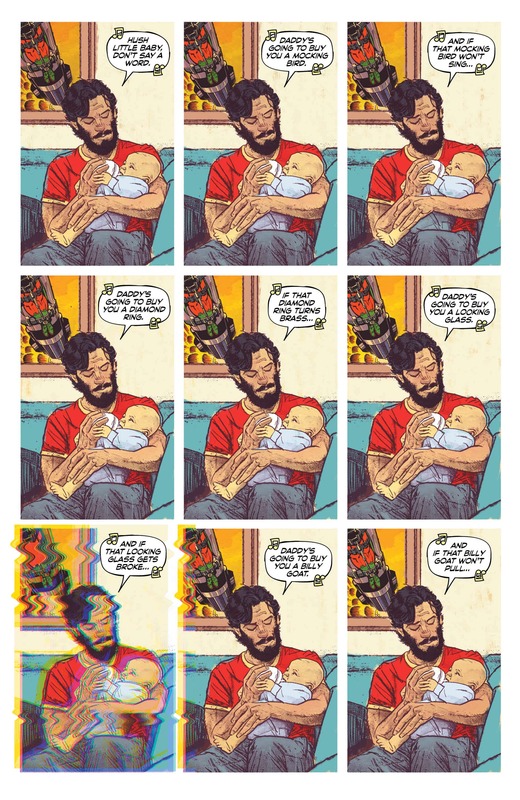 Overall, Mister Miracle #8 is a wonderful read and something really different in the industry. Whilst not necessarily for fans of smash mouth superhero brawls, this offers a great change of pace that is sure to delight readers of all generations. 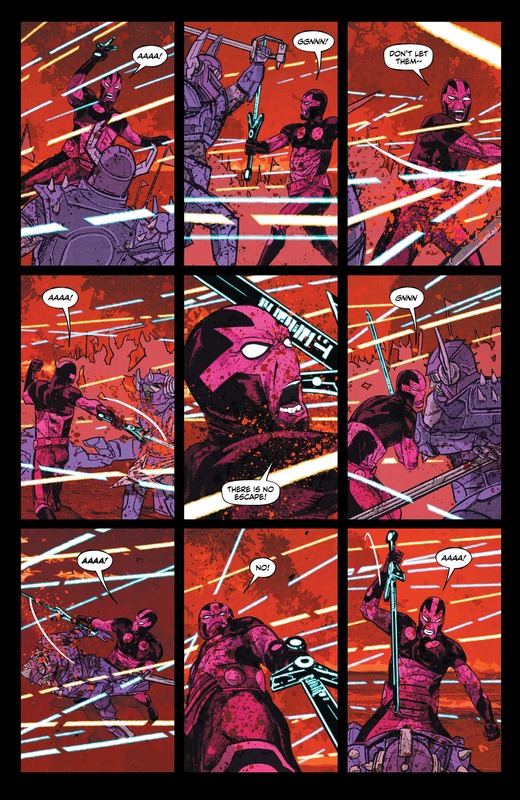 Continuing to feel like it belongs in the ’80s, with clear references to Jack Kirby, the books are beautiful as always, with Mitch Gerads providing some on-point art. The book may best be placed with older fans that not only have ties back to ’80s comics but are now finding parenthood in their own lives and are experiencing the struggles of balancing a professional life, a love life and friendships whilst still maintaining the health and well being of a tiny human. Where Mister Miracle will go next is intriguing as always and the stakes of the phenomenal series continue to be raised. If you are looking for a title that looks to switch up the genre and really focus on elements other comics only touch upon, then Mister Miracle #8 is the read for you. I came here to post one of the pages with the exact same drawing copied-and-pasted 9 times in a row, to show how lazy & low-effort this comic book is. But you actually showed one of those pages, and you pretended it was “on-point art”. The only point it’s on is showing a lack of respect for the readers, the characters, Jack Kirby, & comic books in general. Scroll up and look at the first page shown in this article. Imagine you’re making a cheap indie comic book that you don’t even care about, so you go to Fiverr & pay a graphic artist $5 per panel for a page of sequential art. Is it sequential when it’s the same thing 9 times? Would you feel happy paying the extra $40 for someone to hit Ctrl+V 8 times, even for a bad comic that no one would read? I made a poll about this on Twitter, & 75% of the people who voted said they’d feel ripped off paying an artist $5 for that work – work that’s sold to us as professional quality art. Maybe they copy-and-paste so much because they’re rushed to make the deadline? No, they have no problem delaying the book for a month. And the 1st issue, presumably the least rushed, uses the same solid-black panel 23 different times in only 22 pages. And 1 of the pages is just solid black. And what about the writing? If you hired someone for 9 panels of dialogue, & they just copied a lullabye, or stole some text from a Jack Kirby book & pasted it over unrelated images where it made no sense, would you pay for that? The previous issue takes place entirely in a hospital, and nothing happens during the entire issue except that a baby is born. This issue shows everyone constantly discussing babysitting during battle, to let us know that the battle isn’t serious or any real danger. This Mister Miracle series is a boring waste of time & money. The entire concept of the book is to use computers to make it as quickly and cheaply as possible, with as little effort and creativity as possible, and it shows.